Visitors to the Petaluma Arts Center’s juried exhibition, Fire/Ice, which explored the opposites of life and closed July 24, were greeted in the lobby by funerary vessels that reflect a broad range of designs, sizes and media. 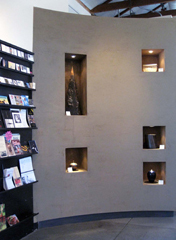 Each was installed in a lighted niche, 28 of which populate curving walls covered in softly mottled Venetian plaster. Some were stoic and serene, others whimsical, and one was carved from a solid block of salt. 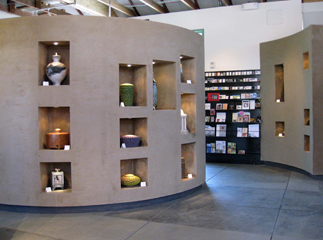 They were installed at the invitation of the Petaluma Arts Center and provided courtesy of the artists and FUNERIA. Images of the festive opening reception are posted on our Facebook page. FUNERIA is credited for leading a contemporary funerary arts movement by organizing and promoting biennial international juried Ashes to Art® competitions and exhibitions since 2001 that have generated a new marketplace for artist-made urns. The events showcase superbly crafted examples of original urns and vessels that are selected on the strength of their beauty and craftsmanship by distinguished jurors, but are also intended to contain cremated remains, belying their function. Eight of the nineteen artists whose works were included in the Petaluma installation have won awards in FUNERIA’s exhibitions. Blue Urn is a forged steel piece with a unique patina by 2010 Best of Show recipient Nathan Blank. 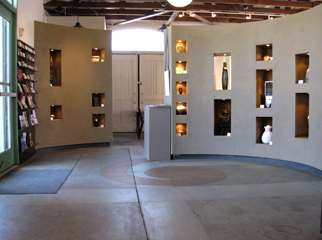 Two of Blank’s other artworks, including his award-winning Bridge Urn, remained to be enjoyed by visitors to FUNERIA's Art Honors Life gallery in Graton. 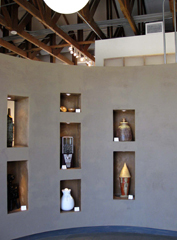 Petaluma visitors saw a 26” tall sand-cast Pyramid urn from 2008 by metalsmith Shawn McDonald who earned Best of Show honors in 2003 and a subsequent commission to create an urn for a family patriarch and vineyard owner. Flying in from his home in Alaska, McDonald personally delivered the completed piece to the family in Gilroy. Visitors also saw Ranna McNeil's Sunburst. McNeil casts glass in the pate de verre process and has won the Excellence in Glass awards in both 2001 and 2003. Ceramist Carol Green earned the Jurors Award in 2003 and Randy O’Brien was the Excellence in Clay recipient in the same year for one of his dramatically fissured Lichen Urns. Brian Gilman’s Oval Image in stainless steel was the 2008 Excellence in Metal winner—a torqued column, apparently seamless, that has been favorably compared to Richard Serra’s massive curved steel shapes, but to human scale, in the Lonely Planet Encounters Guide to Napa/Sonoma where FUNERIA’s gallery was highlighted by writer Alison Bing. Also shown in Petaluma was Harvest Urn II by 2006 Best of Show winning artist Paul McCoy. Among five woodworkers represented was 2008 Excellence in Wood recipient James D. Remington, whose Free Hand Maple Burl Vessel. 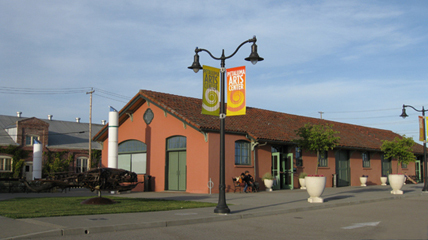 The Petaluma Arts Center, one half-hour north of San Francisco, occupies the historic Railroad Depot Freight Building, next to the Petaluma Visitors Center, at 230 Lakeville Street at E. Washington Street. PAC is open Thursdays through Mondays, from Noon to 4PM. Visit petalumaartscouncil.org. Copyright © 2013 FUNERIA | Art honors life with unique artist-made cremation urns, original handmade keepsakes and beautiful funerary art. All Rights Reserved.